Photo credit: http://www.datacenter.org/?attachment_id=8542Native American organization; Indian People Organizing for Change (IPOC), Co-Founder and Lead Organizer , Corrina Gould demands the removal of the warrior mascot at John Swett High school in Crockett, CA. 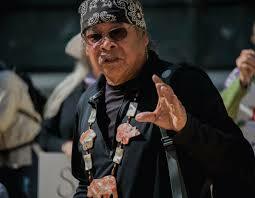 IPOC is an organization that educates the public on issues affecting First Nations Peoples. IPOC promotes awareness and educates the public about the desecration of Native American sacred sites, and Shellmound desecration in the greater Bay Area. Sacred Sites Protection and Rights of Indigenous Tribes (SSPRIT) advocated for the removal of the Indian mascot, addressing John Swett Unified School District (JSUSD) in February of 2014. IPOC supported SSPRIT’s advocacy, providing a statement for the JSUSD Board of Education (BOE). In her correspondence to JSUSD BOE, IPOC, Co-Founder Corrina Gould stated, “Our people have heard many of the excuses of why naming a team after a race of people is supposed to be in some way honoring them. Our people decided that this is not a way of celebrating who we are, but rather it continues the devastation of dehumanizing us; a continued cultural genocide. School districts should strive to teach its students the real history of the space they now occupy on Ohlone territory”. On February 11, 2015, one year after SSPRIT’s advocacy began, JSUSD BOE voted unanimously to remove the Indian mascot. JSUSD BOE, and SSPRIT agreed, the Indian mascot removal could provide a teachable moment. The district approved a SSPRIT mascot discourse for students. SSPRIT facilitated the discourse at John Swett High School; all students, grades 9-12. The discourse addressed cultural relevancy & appropriate mascot replacements. At this time, the warrior was a popular mascot replacement choice within the JSUSD community; including, several, but not all JSUSD BOE members, students, parents, and alumni. SSPRIT advised the board that Warrior mascots often portray images of violence, weapons of violence, and that warrior mascots are most often depicted as Native American. There are 85 schools in California that use Warrior as their mascot; each is depicted as Native American. Prior to the mascot discourse, JSUSD BOE created a Resolution forbidding the use of violent imagery, and forms of violence in connection to their schools. Despite JSUSD’s Resolution, and despite the Native American Cultural Educational Consulting provided by SSPRIT, On February 15, 2016, JSUSD BOE voted to replace the Indian Mascot with Warrior. In response to JSUSD’s decision, IPOC, Lead Organizer, Corrina Gould states, “I am disappointed that in this time of great change, the work that has been put into working together as different communities, to educate one another, to see different perspectives; to honor one another with respect; has been cast aside. I am demanding that the school board reassess their decision to change the mascot name to warriors. I am asking that this Board do what is ethically, and morally right, to be the leaders that our children can look up to, to make the right decision, and to retract the last vote”. SSPRIT will be addressing the JSUSD Warrior Mascot at the districts next school board meeting on Wednesday, March 9, 2016.